People often ask me what the best bore snake kit is and you’ll find them here. We’ve probably used just about ever brand of bore snakes over the years and some are better than others. You should use a bore snake after firing your weapon each time. 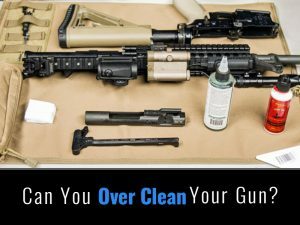 However, there’s no comparison when cleaning your gun with good cleaning rods and a variety of good brushes. It’s similar to mopping your dirty floor with a cotton mop or getting on your hand and knees and scrubbing it with a bronze brush. That’s why in this in this review we’ll be taking a look at some of the newer lesser known brands as well as the big name brands to see how they compare. For those that aren’t familiar with bore snakes you can scroll down to the bottom for a brief explanation and history of the bore snake. Hoppe’s is the band that made the name Bore Snake famous. Back in WWII Hoppe’s was the bore cleaner that was given to you in your gun cleaning kit and they gave you a cotton “bore snake” as well. Over the years they have re-designed and improved their initial cotton string into a cleaning tool that has become essential for most gun owners. 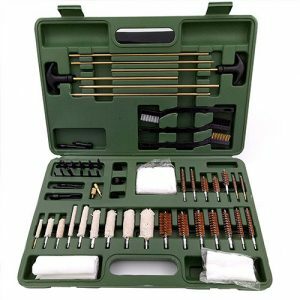 The Hoppe’s Choose your Caliber kit has been a popular option for decades. I remember seeing this kit in the hunting store about 20 years ago. Hoppe’s has been around for over 100 years, so I think they have been making boresnakes for about as long. By now they should have mastered it. Their cleaning solvent is second to none and this is one of the few kits you’ll find that comes with cleaning solvent. The carrying case is pretty nice and has gotten a lot of high praise. I actually owned this kit about 5 years ago but I lost the bore snake on a trip to Canada. You can see that the tip of each bore snake is labeled with the caliber. This makes it pretty easy to keep track and I wish all bore snakes did this. The kit can be customized to your caliber and you simply select the caliber of bore snake that you want. They have both rifle and handgun kits that work for just about all firearms. Overall, this is probably one of the best options because the Hoppe’s CLP is probably the best bore cleaner out there. Never heard many complaints from the Hoppe’s bore snake and I’d say it’s certainly one of the best without any question. 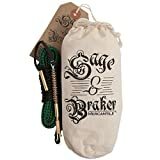 When I first bought the bore snake from Sage & Braker I was so impressed after using it only one time that I bought another. The quality of the main floss area is amazing and I haven’t really seen a bore snake that compares. I’m not the only one that likes this bore snake either. On Amazon it has 1,000+ reviews and most of them are 5 stars. The brass cleaning brush is unique and many new bore snakes have begun adopting this. You can actually detach the brush and use other ones, such as nylon brushes. Similar to the Hoppe’s Choose your Caliber kit, the caliber is embossed on the brass tip. The main reason this bore snake has become so popular is because of the brush and the quality of the fabric. In my opinion it’s one of the best out there. Most people, including myself, prefer to use a good universal gun cleaning kit over a bore snake. You save money with a kit because you need to buy a bore snake for each caliber weapon you own. If you own several, you’ll looking at about $200 worth of bore snakes. The biggest problem is keeping track of all your bore snakes! I’ve resorted to color coating them or putting duct tape with a label on each one. 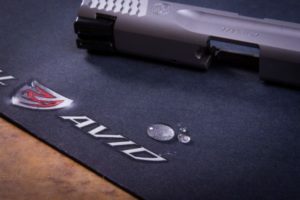 Real Avid just released their new bore snake this year and it’s gotten a lot of good reviews. You either love it or you hate it. The bore boss comes in a variety of calibers and comes with a case for each bore snake, so you don’t forget which caliber it is. The snake is made of wire with a plastic coating and different plugins you can attach, such as a brush. The plastic case is about the same size as a hockey puck and I really like the design. I decided to buy one a couple of weeks ago and I’ve been using it instead of my Hoppe’s. I have a feeling I will be replacing my old bore snakes with this one because I really like it. The best thing about this style of bore snake is that it goes into the bore without having to push it in. This was always a problem with most of my other bore snakes. I’ve been a big fan of the M-PRO 7 cleaning solvent and even have one of their bore snakes and it’s great. 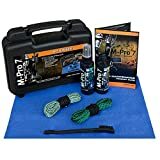 The guys at M-PRO7 have some real world combat experience and have taken everything they’ve learned over the years and made a terrific product. A good bore snake will cost you about $25 each. This is why this bore snake kit is a good option because you get several bore snakes and cleaning solvents. If you were to purchase everything separately, you’d be spending almost double what you would spend on a kit. Then the only question is, what’s the best bore snake kit? You can see the quality of their brushes are second to none. I really like how the brass wires are woven into the material. Calibers Include: 5.56mm and 7.62mm. 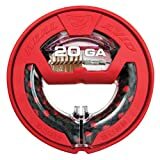 Can also be used with .22, .223, 5.7x28mm, .22-250. 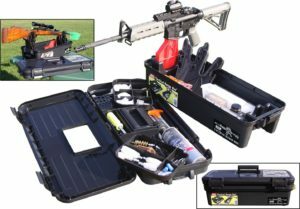 This is the best gun snake kit comes with two bottles of cleaning solvent as well. 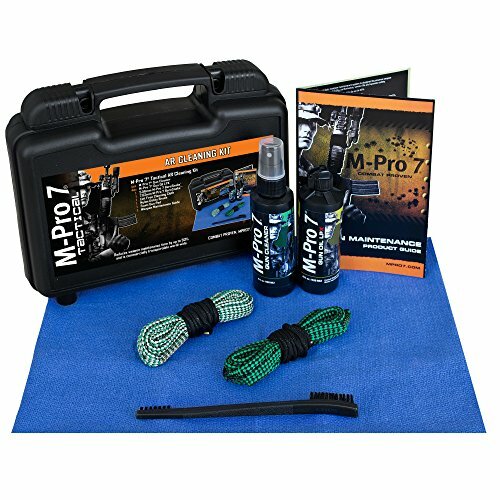 The M-Pro 7 Gun Oil LPX is what I use to protect my gun after cleaning and it’s been tested to be a better protectant that most of the ones out there. 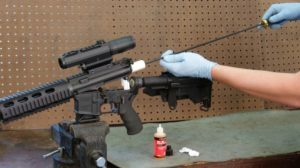 There have been several tests that I’ve read about where they spray a gun with salt water after spraying it with a gun protector, and only the M-PRO oil protected the gun. While this one doesn’t come in a kit we wanted to include it on here because they make some high quality VERY inexpensive bore snakes. I purchased these because they were so cheap and the quality is pretty darn good. This bore snake works just as well as most others and costs half the price. It doesn’t include a brush but it does have small bronze pieces built into the fabric. If you’re on a budget and have several different size rifles and shotguns, then this is the best way to go. This is not a big name brand and they make some dubious claims on their site but for the price you can’t go wrong. Buying several bore snakes can get expensive, so if you want to save some money and get a pretty darn good bore snake then this is the one. One of the things I didn’t like about these is that they don’t label the caliber on the pin. I had to use a little piece of tape for each one but I suppose that’s not too big of a complaint but still something you should keep in mind. There’s the quick way to clean your gun (using a bore snake) and the slow thorough way (using cleaning rods). Both have their places and let’s take a look at when you should use a bore snake. 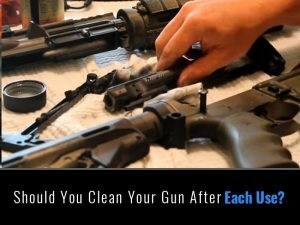 It’s recommended to give your gun a quick clean after every time you shoot. 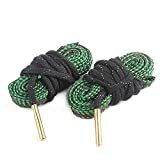 Most people who are interested in gun cleaning kits will already know how to use a bore snake, so I won’t go into too much detail. To use a bore snake you simply add a little cleaning solvent to the first area of floss and drop the brass piece through the breach of your gun. Then, you pull it out of the other side. 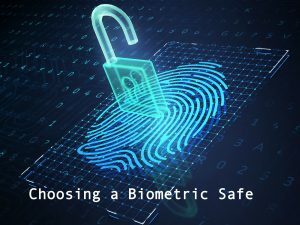 It’s really quite simple and watching a video will pretty much show you how to do it in a few minutes. What this does is clean and lubricate your barrel and the same time. Bore snakes are not included in gun cleaning kits and should be purchased separately. 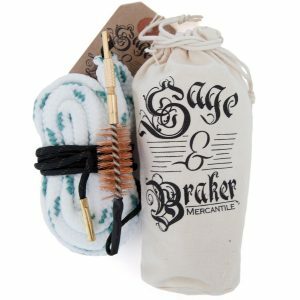 There are a couple that we really like and those would be the Sage & Braker’s Bore Cleaning Kit and the Hoppe’s BoreSnake. Not all bore snakes are created equally and if you are looking to try out a couple then we wouldn’t recommend either the Sage & Braker’s Bore Cleaning Kit or the Hoppe’s BoreSnake. Both have 5/5 positive reviews on Amazon and are considered the best bore snakes on the market. You might be wondering where the bore snake comes from and when it became popular. The name “bore snake” is brand name, similar to kleenex. The military was using Hoppes #9 bore cleaner and wanted something they could use other than their cleaning rods, in order to clean their guns faster. These small cotton string pieces of fabric (bore snakes) became standard issue in the US military in WWII, along in their gun cleaning kit. They were designed to be used when you couldn’t use your gun cleaning rods, usually due to time constraints. The popularity in the bore snake continued to rise and other countries and police soon adopted it. It became popular with police officers and snipers as a time efficient alternative to the gun cleaning rods. A bore snake kit is meant to be a quick way to clean your gun and not a substitute for a gun cleaning kit. The good thing about them is that they’re designed to be used with a specific barrel size. This means that it can get it very clean, while on the other hand it also means that it can’t clean other barrel sizes. If you have ever watched the ESPN sniper competitions, you will see many of the shooters using bore snakes after they fire their guns. This is because after each shot you fire, a small amount carbon residue builds up on your barrel. While it may only be only a fraction of a mm of carbon, it can affect the trajectory of your next bullet. Therefore, using a bore snake will most certainly improve the accuracy of your shot. The other reason to use a bore snake is because it’s quick! While you still may encounter a few problems with your bore snake, such as choosing the wrong caliber, you really can’t go wrong. You can see here that the bore snake has four main sections. 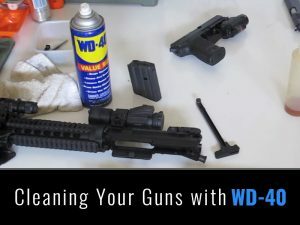 Each of these sections plays a role in making sure your gun is clean. Over the past decade there have been some big improvements in bore snake technology. Back in the day it was just a cotton cloth but over the years they have really improved the bore snake design. In particular the bore snake has become a very popular alternative for shotguns. Rather than using a shotgun cleaning kit, which can take a lot of time to clean, simply use a bore snake. Because the shotgun doesn’t usually need to be as accurate as a rifle or handgun it’s a very good idea. Hopefully we found the three best bore snakes for you. The traditional ones are still pretty good but I would go with the wire brush ones, which seem to working a lot better and to honest, I love them.